We believe Vancouver, like other GREEN cities, should have motorcycle/scooter parking ... LOTS of it! Some MLAs & Councillors just hate motorcycles! Motorcycle riders: Is Lane-splitting safe? What about Filtering? Check out our M/C Parking News page! Vancouver Vision Council has always been annoyed by Motor Scooters! 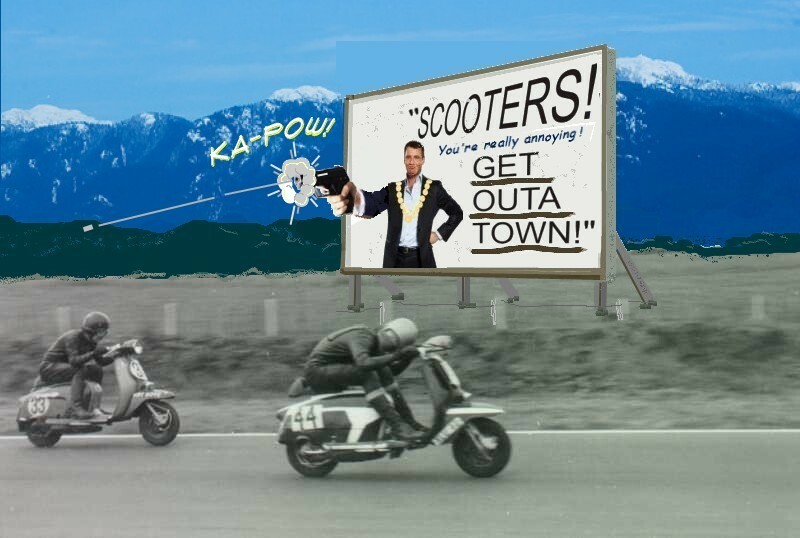 VANCOUVER,BC: With increasing numbers of Vancouver residents dodging traffic jams by commuting to work on motorbikes & scooters, Vision Vancouver's council has decided to get tough. Vancouver commuters are not to be encouraged to avoid riding bicycles or transit! Motorbikes, especially the smaller sizes, have been observed parking for free in the West Broadway area. Scooters and motorcycles, by using less fuel, are also not paying their fair share of parking tickets, transit & global warming taxes. Vancouver rakes in $25 million per year in parking tickets, and free-loading scooters don't help. 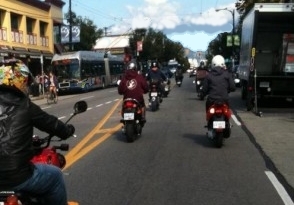 Vision's council members are becoming upset at motorcyclists boycotting transit & bicycles. Vision Vancouver's council is panicking and has decided to push 2-wheel-commuters to switch to bicycles or transit by eliminating motorcycle parking spaces, and ticketing scooters that try to park for free. Richmond Tries a New Tactic: Confusing the Motorcyclists! 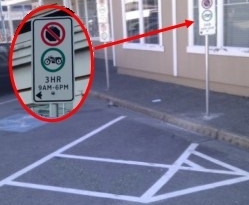 RICHMOND,BC: When the City of Richmond discovered that motorcycle commuters were trying to visit the tourist village of Steveston, they knew that extra vigilance would be required to discourage motor-cycle parking in the village itself. 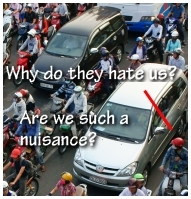 Richmond Traffic Bylaw #5870 says" . . . no driver shall park any vehicle otherwise than between the lines or markings indicating the limits of a parking stall". These clever parking spaces are designed to confuse motor-cyclists, and when they try parking "otherwise than between the lines", traffic enforcement officers promptly ticket the confused offender! Richmond makes a huge financial surplus from ticketing motorcycles. Saskatoon Takes Aim at Scooter Anarchy, Kills Parking Freebies! SASKATOON,SK: Significant numbers of Saskatoon citizens have been found to be avoiding public transit by driving to work on 2-wheel motor-scooters. These tiny vehicles are able to scoot about using very little fuel, but they can also be parked for free in little nooks and crannies, often in doorways or behind dumpsters. As in Vancouver, transit administrators are upset since they see the scooter drivers as avoiding paying transit fares, or shirking their civic duty to ride bicycles. Saskatoon City council is now trying to rectify this imbalance by ticketing, towing, and impounding scooters, and by restricting motorcycle parking.